As all Birchbox Canadians know, they ended their subscription service in Canada. The last box was February, and we are able to use our points in the shop until April 2016. Being sad that my favourite subscription box was ending, I seeked out another sub box I could purchase. I have heard many good things about many services, but I decided I wanted to stick with something Canadian. I like that they offer free shipping, and are pretty much in the same price range as other boxes. 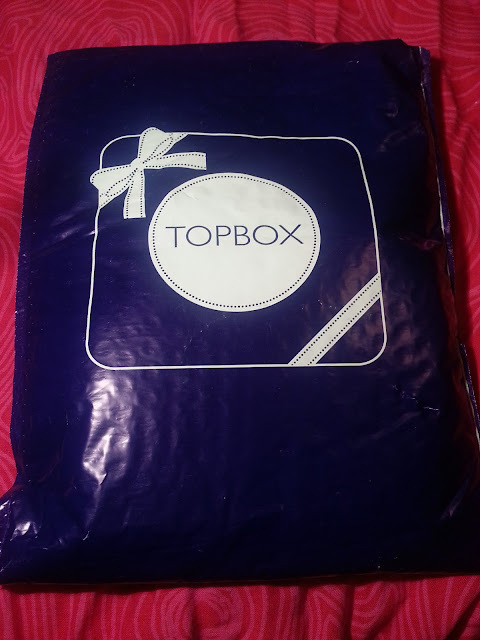 My searching led me to Topbox, which is in Canada and very affordable. It is only $12 a month, plus tax.. which works out to be $13.56 in Ontario. See! Affordable! AND FREE SHIPPING! Awesome. I signed up just before Birchbox announced they were ending operations here, so I didn't have to wait. I know a week or two later there was a wait list... which there still might be now. The box ships on the 15th of the month, and mine arrived pretty quickly! I got a notification saying it was shipped on Friday the 12th. We don't get mail service on the weekends, so that eliminates Saturday and Sunday, and Monday was a holiday here. It arrived on Tuesday the 16th! 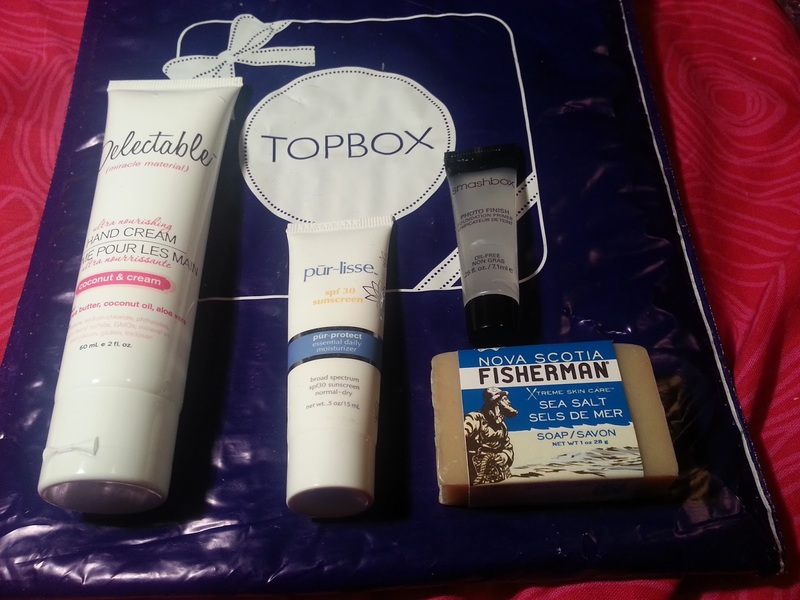 So let's take a look at my FIRST Topbox! 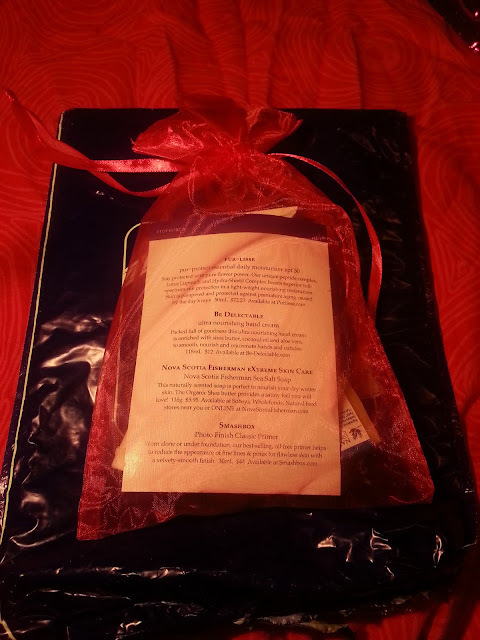 They give you an option as to whether or not you want to receive your monthly box in a cardboard tube or organza bag. I like the idea of the tube but I feel they would take up a lot of space if I decided to keep them, so I opted for the organza bag. Plus, they can be reused for so many things! This is just the purple mailer it comes in! My lighting is terrible in this picture! Anyway, all of the items are inside of the pink organza bag. There's also a product card included to let you know what exactly you got! While stalking Instagram, it looks as if almost everyone got this hand cream. Again, I don't need hand creams, but this one smells great! It will definitely be used! I swear pur-lisse is exclusive to ALL beauty subscriptions. I had never heard of this brand and I get it so often from all of these different subsriptions. I think I still have another sample or two of this exact moisturizer. I'm scared to try it. Maybe I'll eventually give it a try, or pass it on. Another famous subscription box sample. I don't know how many of these I have received. Anyway, I'm not really a fan of this one, so I will be gifting it. I haven't checked the site out though so I'm not sure what the pricing is like on their products, or what they exactly carry. Overall - I wouldn't say that this is the greatest subscription, but this is just my first box from them, so I feel that wouldn't be a fair evaluation if I immediately claim that I didn't like it. Also, they don't claim to curate your bag like Ipsy does. Everyone pretty much gets the exact same bag - except for those who choose a prive box. I decided not to upgrade to a prive box because I wanted to see what I would be sent. I did take some screenshots though of what was being offered. I wasn't interested in 2 hand creams, or those 2 shadows as they aren't colours I'd normally wear, and I don't have curly hair. So the decision not to get a prive box wasn't a hard one! I'm excited to see what I will get in next months box, and I like that there isn't a sneak peek, so it's a secret until it gets to you! 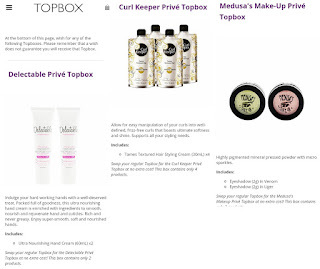 If you're Canadian and you're looking to try a new subscription, think about adding Topbox to your collection!